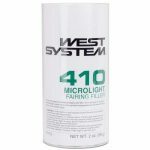 West System 410 Microlight™ Fairing Filler - Goosebay Sawmill and Lumber, Inc.
410 Microlight™ is the ideal low-density filler for creating a light, easily-worked epoxy fairing compound especially suited for fairing large areas. Microlight mixes with epoxy with greater ease than 407 Low-Density filler or micro-balloons and is approximately 30% easier to sand after the epoxy/410 mixture cures. Epoxy thickened with Microlight feathers to a fine edge and is also more economical for large fairing jobs. Not recommended under dark paint or other surfaces subject to high temperatures. Cures to a light tan color. Larger size containers can be ordered. Special orders are subject to minimum quantities but can often be an “add on” to our regular restocking order. Once ordered, arrival time at our store is usually within 2 business days.